Dried cranberries are pretty easy to find these days but their quality can truly vary. While I am usually a huge fan of buying in bulk, I have often found bulk dried cranberries to be dried out and not very vivid in color. I keep coming back to Ocean Spray Craisins, which are not only brightly colored and very tasty, but they are consistently so and also readily available at most supermarkets. 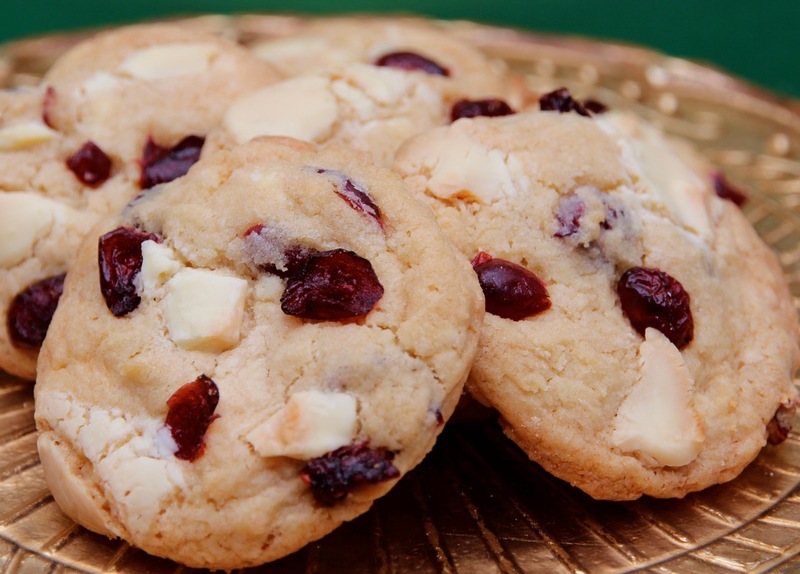 This cookie features tangy/sweet dried cranberries and white chocolate in a brown sugar enhanced dough. The dough freezes well and they are a nice alternative to dark chocolate chunk cookies or ones with nuts. 1. Preheat oven to 375 degrees. Line 2 half-sheet pans with parchment paper. 2. Whisk flour, baking soda and salt together in a small bowl to aerate and combine; set aside. 3. In a large bowl with an electric mixer on medium-high speed, beat butter until creamy, about 2 minutes. Add sugar and light brown sugars gradually, beating until light and fluffy, about 3 minutes, scraping down the bowl once or twice; beat in vanilla, then beat in eggs. Add about one-third of flour mixture and mix on low speed. Gradually add remaining flour mixture, mixing just until blended. Stir in chunks and cranberries. (You may freeze dough up to 1 month; defrost in refrigerator overnight before proceeding).